Sometimes it is unfair to base everything on the previous season on just one game but when that game is the Super Bowl, it is hard to erase those memories. And for the Patriots, the problems that were plain to see in the Super Bowl against Philadelphia were symptomatic of problems the team faced all season and was able to overcome. But against a team with a hot quarterback and an offense that blew out the prevailing #1 defense in the NFL, perhaps we should not have been so surprised at the outcome. Specifically, the defense all season struggled to stop the run, especially inside, they struggled to get consistent pressure on the quarterback as well as setting the edge and the coverage by the linebackers was spotty at best. So who is the most important off-season addition in 2018? Adrian Clayborn. 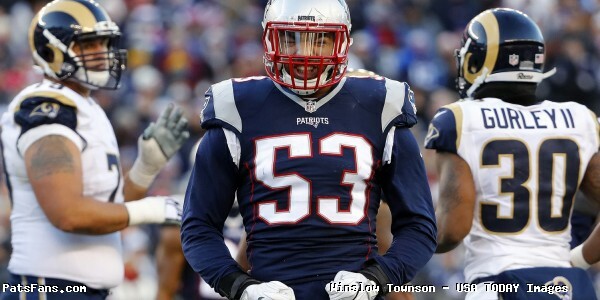 After an offseason of losing Jabaal Sheard and Chris Long to free agency, Rob Ninkovich to retirement and Dont’a Hightower, top 2017 draft choice Derek Rivers as well as rookie Harvey Langi on IR last year, they were notoriously thin at the position. One bright spot was the play of rookie Deatrich Wise who chipped in 26 total tackles and five sacks. He added an additional four tackles and two sacks in three playoff games. Less impressive, however, was the play of Cassius Marsh, who wasn’t a fit in the Patriots system and Eric Lee, both of whom had issues setting the edge. That’s why they brought James Harrison late in the season. It put too much pressure on Trey Flowers and the defense suffered for it. Hightower, Langi, and Rivers are back, which is huge. Wise will be better in Year 2 which helps but in getting Clayborn, the Patriots should have plenty of depth, and production…if everyone can stay healthy. 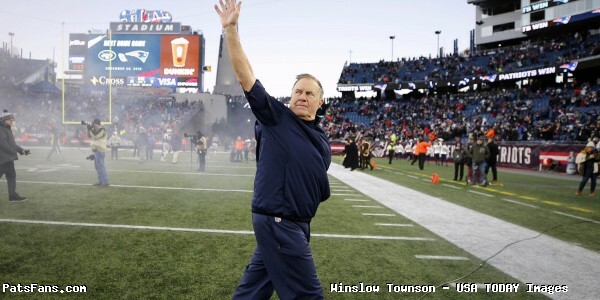 The Patriots and Bill Belichick have known Clayborn’s value for some time now. He played at Iowa under Belichick close friend Kirk Ferentz, they watched him in joint practices where he played for another Belichick close confidant in Greg Schiano. He’s had injury issues over his career but was healthy for all of 2017 and had a career-high 9.5 sacks and two forced fumbles for the Falcons. He’s yet another former 1st round draft pick (#20 overall in 2011), that the Patriots have brought in later in their career. With the addition of Danny Shelton inside with Malcom Brown, Lawrence Guy, Adam Butler and the return of Vincent Valentine, the interior of the defensive line should be much improved over 2017. They also double-dipped at linebacker in Rounds 5-6 in the 2018 NFL Draft with Ja’Whaun Bentley (#143) and Christian Sam (#178) which should also help the issues with the position. Overall on paper, the unit they have now, with the additional players they’ve added in the secondary looks much, much better than the squad that took the field in the Super Bowl. So who is the most important addition to the defense? He actually isn’t an addition at all, but his responsibilities are added on to. Brian Flores. With Matt Patricia now a head coach in Detroit, Flores has the play-calling responsibilities as a defensive coordinator but not the title, which he doesn’t care for anyway. Flores himself, the Patriots linebacker coach/defensive coordinator has gotten consideration from the Arizona Cardinals for their head coaching position. Flores has been with the Pats since 2004 and will be watched closely in 2018 to see how he handles the pressure. When he met with the media about a week ago, it is pretty obvious why so many speak so highly of him. He says all the right things and has his head screwed on straight. His main defensive philosophy is to help the players become the best version of themselves — on and off the field. Belichick had to be smiling when he saw that Flores, after being asked many times about putting his own personal stamp on the defense, deferred. Instead, he mentioned making a “team imprint” on defense. His goal he said, is “going to sound like a Bill Belichick-coached team.” Flores spoke about playing under pressure, being tough, smart and dependable. All of these things are exactly the right thing to say if you’re Flores. Now he’ll have to do it on the field and prove that he’s up to the task. Something about that leads one to believe that he will be just fine as the team’s new defensive coordinator. This entry was posted in 2018 Patriots Draft, 2018 Patriots Offseason, NFL Commentary, NFL News, Patriots Commentary, Patriots News and tagged 2018 Free Agency, 2018 NFL Draft, 2018 Patriots Draft, 2018 Patriots offseason, 53 Man Roster Projection, Adrian Clayborn, Bill Belichick, Brian Flores, Dont'a Hightower, Jabaal Sheard, New England Patriots, NFL, Patriots, Patriots defense, Patriots defensive coordinator, Patriots edge rushers on May 16, 2018 by Steve Balestrieri. This one was settled long before Graham Gano boomed a 48-yard field goal easily thru the uprights of Gillette Stadium with no time on the clock for a 33-30 win for the Carolina Panthers over the Patriots. New England had a chance to pull off another miracle finish. 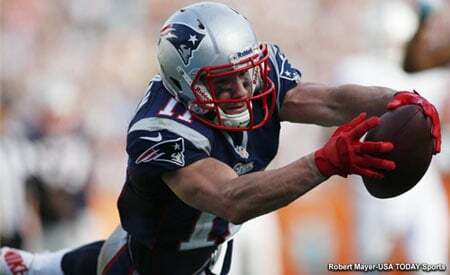 Tom Brady rallied the troops from two touchdowns down in the fourth quarter and the score was knotted at 30 apiece. 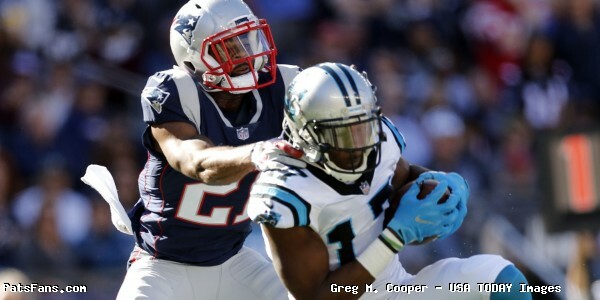 The Patriots had the Panthers with a 3rd and 7 from the 27-yard line and Deatrich Wise sacked Cam Newton back on the 16. If the play holds up, Carolina punts from deep in their end and nobody in the stadium thought that Brady wouldn’t drive them for a game-winning score with 2:23 to go. But Stephon Gilmore got called for illegal hands to the face, (his second such penalty of the day) and the Panthers got a new life and you could see what was going to happen. Newton moved them easily down the field and they were well within range after a kind of ticky-tack 5-yard penalty on Pat Chung. There were several ticky-tack calls on the Patriots today, the first on Gilmore was like the Ali invisible punch. And truth be told, Jerome Boger’s crew is easily the worst in football. They are singularly horrible. But if you’re trying to blame this one on the officiating, unlike the 2013 Carolina game, you’re seriously deluding yourself. The Patriots didn’t deserve to win this game and were badly outplayed on the defensive side of the ball. I was thinking at half-time that three weeks from today will be the 50th anniversary of watching my first Patriots game. October 22, 1967, at Fenway Park and the Patriots were annihilated by the Oakland Raiders 48-14. The Raiders were on their way to the Super Bowl. The Pats? To a 3-win season and into the early 70s as arguably the worst team in pro football. The Raiders rolled up about 400 yards of offense and the Patriots managed just 83. Yep, just 43 yards on the ground and 40 thru the air. And at halftime, I came to the realization, that right now, after four games this may just be the worst Patriots defense I’ve seen in 50 years. And there is no reason for it. Those teams had no talent, so there were no surprises when they lost and lost big. Talent isn’t an issue here, these guys didn’t just forget how to play football all of a sudden. This was largely the same group that led the league in points against and won the Super Bowl last year. They’re not getting beat physically, that would be easier to deal with I think. No, this team is getting beat mentally, which is what they pride themselves on. They were going to play mistake-free football, wait for the opponent to make the error and then capitalize on it. Now they are the ones making blunders…. And they’re making them all over the field. The Patriots mantra is “Do Your Job”. We just watched the NFL Films documentary on that before the opening game. Well on the defensive side, no one is doing their job, not the coaches, not the captains and certainly not the players. It isn’t an anomaly, it is a trend, they’ve blown multiple coverages every game for four games and a quarter of the season is gone. I cringe when I see opposing QBs throw the ball deep because I expect to see someone running wide open down the field….much like we’ve seen every week. The Patriots just allowed two of the worst offenses in the NFL to put a combined 66 points and 861 yards on them the past two games and that is damn alarming right now. Think about how ugly this really could be. Because, despite the defense’s travails, the offense is playing tremendous football right now. Despite the defense allowing 128 points so far this season, the offense has scored 129. Think about that for a second. Imagine if the defense were just playing so-so, how many more opportunities would the offense have to score? Those Patriots teams of yore were as equally inept on both sides of the ball. That 1967 team in the final four games of the season allowed 141 points, but their offense was only scoring 78. If Brady wasn’t playing at an all-world level right now, things could easily be really ugly. The communication is really bad and asked if things could be simplified, Duron Harmon gave perhaps the scariest answer of all. He said they’ve simplified it as much as they can. And yet every game, players are running uncovered down the field. And before everyone gets all over Stephon Gilmore, he’s far from the only one missing the boat out there. The 28-yard touchdown screen pass to Fozzy Whitaker was a microcosm of what ails this defense. At the snap, Devin McCourty, and Gilmore rushed from right to left. Inside linebacker Elandon Roberts also took a 45-degree angle to the left. But the Panthers ran the screen to the right and nobody was home. Just a sea of white jerseys blocking. The two long pass plays to Devin Funchess? Much the same. Nobody from the Patriots in the area code. We keep saying the issues are mental and are fixable….well they’ve been making the same ones and a lot of them for four weeks. Now they have a game in four days against …. Yet another mobile quarterback. I don’t know if the answer is to sit anyone in the secondary, but the coaches aren’t getting thru to the players out there. One issue that needs to happen on Thursday is to move Dont’a Hightower back to the inside linebacker position. Roberts is a situational player at best and not a starter inside. That will at least solidify the middle of the field and in the running game. Move Kyle Van Noy back to where he’s more comfortable. I saw that they actually did do that for a few snaps as Hightower was spying on Newton after he scrambled. But beyond that, the coaches have their work cut out for them. Cam Newton played his best game in two years, and they haven’t faced the best QBs on their schedule yet, Derek Carr, Matt Ryan, Ben Roethlisberger, Philip Rivers…and Jameis Winston on Thursday. Buckle your seat belts, it’s going to be a bumpy night. Listen to our Patriots 4th and 2 podcasts on blog talk radio as the writers Russ Goldman, Derek Havens and myself fromPatsFans.com discuss the latest Patriots news Wednesdays at 12 noon. 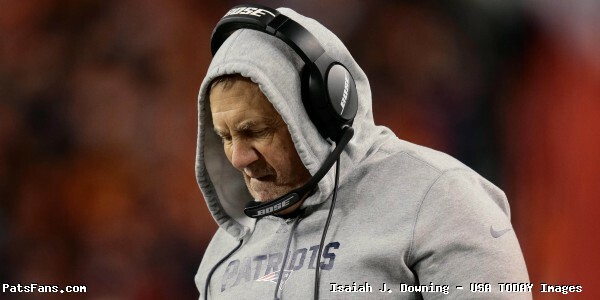 This entry was posted in 2017 Patriots Season, NFL Commentary, Patriots Commentary and tagged 2017 Patriots Season, Bill Belichick, Dont'a Hightower, Matt Patricia, New England Patriots, Patriots, Patriots defense, Patriots edge rushers, Patriots secondary, Stephon Gilmore on October 1, 2017 by Steve Balestrieri.